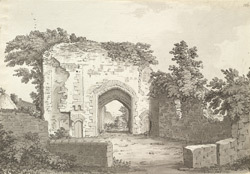 Beverston Castle was built in the mid-13th century by Maurice Berkeley, a descendent of Robert Fitzharding who founded At Augustine's Abbey, later to become Bristol Cathedral. The Berkeleys were a wealthy and influential family and over the centuries the castle received many Royal visitors. During the English Civil War (1642-1646), it was naturally a Royalist stronghold. It was finally captured by Parliamentarian forces who then set about laying the castle to ruin.